Invisalign Teen is a special version of the Invisalign System that is specifically made for teens. Utilizing the same concept of Invisalign, which treats many orthodontic problems by helping teeth move into their ideal positions using micro movements, teens now have a nearly invisible alternative to traditional braces. Like the regular Invisalign braces system, Invisalign Teen consists of clear plastic aligners that are made specifically for your teen’s treatment plan. What makes Invisalign Teen different from regular Invisalign treatment is the special Blue Dot Wear Indicator on each aligner. This blue dot shows your teen how long each aligner has been working and helps them know when it is time to move onto the next aligner. The blue indicator also helps assure you that your teen is wearing their aligners enough, helping to keep them on track to the smile they want. Because there are no brackets or wires in the way, your teen can easily brush and floss their teeth, making maintaining good oral hygiene easy. The traditional braces have wires and brackets that can cause irritation to your gums and other discomforts. 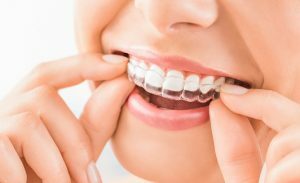 The Invisalign Teen treatment system uses a series of custom clear aligners to gently move and straighten teeth without the pain and irritation that can be caused by traditional metal braces. Whether they are snacking on popcorn at the movies or playing a game of basketball, Invisalign Teen clear aligners can easily be removed during eating or extracurricular activities, providing your teen with the freedom to enjoy their favorite snacks and participate in their favorite activities hassle-free! Don’t worry about them breaking a rubber band or feeling discomfort from the wires because of something they ate, give your teen freedom from wires and brackets with Invisalign Teen. At Severns Dentistry & Orthodontics, we treat every patient like family, providing comprehensive and compassionate dental and orthodontic care in McMurray. Our dentists will expertly evaluate your teen’s unique needs to determine if they are a candidate for Invisalign Teen. Once that has been determined, we will use the clear aligners to help your teen achieve a beautiful, healthy smile without the irritation and hassle of traditional braces. Contact Severns Dentistry & Orthodontics to schedule your Invisalign consultation at our McMurray office today! We provide emergency care for unexpected issues that require immediate attention and have evening appointments available for your convenience. When you come to our office for your dental care, we treat you like a member of our family. Our staff will spend time with each patient and listen to your concerns. We pride ourselves on having a relaxed office atmosphere where you’ll feel at home. Call or contact us today for dental care that creates a beautiful, healthy smile! ©2016 Severns Dentistry and Orthodontics. All Rights Reserved.